Love to cycle but don't love forking out a fortune for the right kit? With a Bob Shop voucher code you could enjoy fantastic savings on a wide range of bike accessories for both amateur and expert cyclists. From all-weather clothing and footwear to keep you warm and dry to gadgets, parts and tools for a safe and comfortable ride, a Bob Shop voucher code will help you look the part for less. Bob Shop started life in 1983 when mail-order company Bike o'Bello was founded. Originally selling a limited range of products through small brochures enclosed in specialist cycling magazines, the company swiftly grew in size, quickly expanding to offer a comprehensive catalogue of cycling supplies. In 1997, the company launched online under the name Bob Shop, offering an ever-growing range of cycling accessories and products to customers around the world. 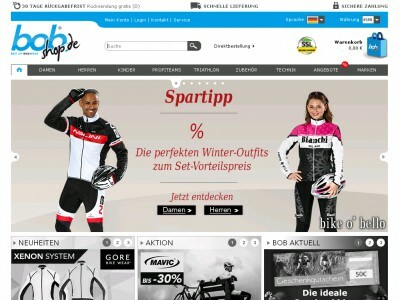 Today, Bob Shop is Europe's leading specialist mail order and online company for cycling clothes and accessories, with over 150,000 items in stock. As experts in cycling, Bob Shop is dedicated to offering a first class service to cyclists of all ages and abilities. The online shop offers a fantastic selection of cycling clothing from all the major cycling brands, as well as a wide range of cycling accessories such as cycling eyewear, saddles, pulse meters, cycling helmets, bags, tools, sports nutrition and much more. With a focus on technical innovation, cycling trends, quality and practicality, you can rely on Bob Shop to keep you looking and feeling great in the saddle – whether you're a casual commuter or a sportsperson committed to achieving the very best. Bob Shop only stocks the very best products from the very best producers – so customers can always be sure they're getting a quality product that's built to last. Want durable and affordable clothing to keep you going in all weathers? Bob Shop has hundreds of products on offer, all available to browse by category on the extensive website. Need some key accessories like new tyres or lights? You can rely on the experts at Bob Shop to get you kitted out with exactly what you need. And with a super fast delivery service, you'll have everything you need to get cycling in no time at all. Want to get shopping with Bob Shop? Whether you're just getting started and looking for advice on the right kit or a seasoned pro looking for top-of-the-range supplies, a Bob Shop voucher code will save you money while you shop. From high-tech heart rate monitors to waterproof shoes, a Bob Shop voucher code is a great way to get kitted out for less. Europe's leading specialist mail order and online company for cycling clothes and accessories. Browse our website until you find a Bob Shop voucher code that suits you, then navigate to their website to begin shopping. When you're finished shopping, click 'View shopping cart'. Enter your Bob Shop voucher code in the box provided and click 'Redeem'. Have you enjoyed shopping for great deals on cycling products with Bob Shop? You might enjoy browsing more sporting accessories at JD Sports or Sports Direct. Or, if those aren't up your street, you'll find plenty more stores in our Sports section. Select your delivery country and click 'Continue to the next step'. Fill in your delivery details and click 'Continue to the next step'. Choose your preferred payment method and click 'Continue to the next step'. Fill in your payment details and click 'Purchase'. Standard UK delivery is free on all orders over 200 EUR. On orders under 200 EUR, a delivery charge of 9.95 EUR applies. If you need to return a product for any reason to Bob Shop, you can do so by filling in the enclosed returns form and returning your items to the company within 30 days. Need to contact the team at Bob Shop? Whether you have a question about your order, need some expert advice on which kit is right for you or simply want to find out more about saving money with a Bob Shop voucher code, you can contact the Customer Services department by accessing the online contact form here. Want to find out more about what's happening behind the scenes at Bob Shop? The company maintains a profile across all your favourite social media networks. Follow them for lots of exclusive content including competitions, special offers, cycling news and much more. You can also use these pages to find out more about saving money with a Bob Shop voucher code. Don’t forget to check them regularly, as you can never be sure when a free Bob Shop voucher code might be waiting for you! Buy now online at www.bobshop.com. Me and my wife love to cycle – but with two young kids we don't have much money to spare for expensive kit. That's why I was delighted to discover a Bob Shop voucher code online. At bobshop.com they stock a wide range of cycling products and accessories – all available at a discount with a Bob Shop voucher code. I used my Bob Shop voucher code to get me and my wife kitted out in weatherproof gear – so now we've got no excuse! See what deals you could get with a Bob Shop voucher code.